Biggest piece of news: Peter got sick during the flight. We think it was food poisoning. Not anything from the airline but something he ate back in Canada. Still, he was miserable for two days and those were two days we didn't dive. 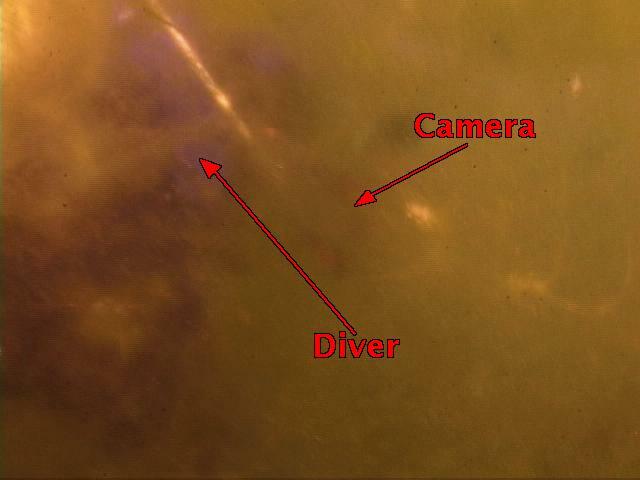 The first week's report therefore is a summary of four dives. The rest of the time, Peter was groaning and green. 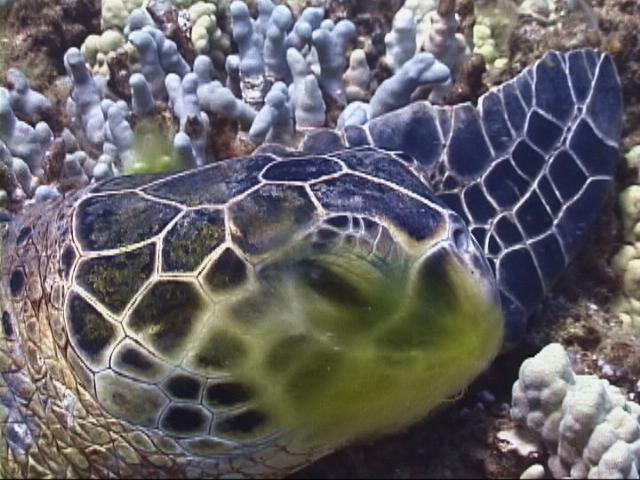 Words fail to describe the volume of green slime algae--Cladophora sericea--at our dive site. 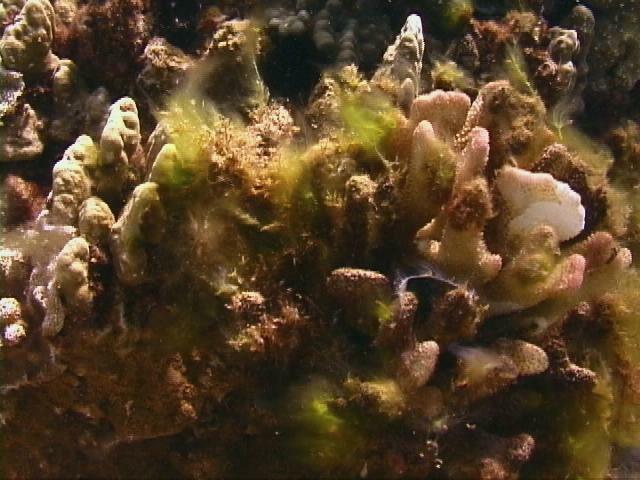 Words fail to describe the volume of green slime algae--Cladophora sericea--at our dive site. Inside the seawall it collects in such volume that we simply can't see. The algae hangs directly inside and outside the wall such that it blocks any view of our entry/exit "hole." This is not really an issue when the ocean is calm--it just makes diving grossly unpleasant. Any kind of swell, however, will make this bloom potentially dangerous for us. We will simply not be able to see the seawall until it comes crashing through our face masks. We will simply not be able to see the seawall until it comes crashing through our face masks. As a precaution we investigated a different entry just to the south. It too is so thick with algae we can't see anything--but the "door" is wider, much wider. We've determined all we need to do is line ourselves up with a certain palm tree and swim straight in. Fortunately, the seawall is quite low there. 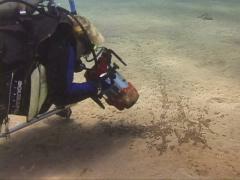 Our first dive was at Reef 2. There was Cladophora algae everywhere. 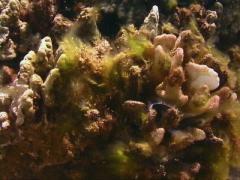 A little coral that had survived the early 90s blooms was now a casualty of last summer's. We have monitored this coral every summer since, and until last year it was growing beautifully. Last summer we tended and plucked it of algae but clearly our fostering wasn't enough. It was now dead, a victim of the 2000 bloom. A little coral that had survived the early 90s blooms was now a casualty of last summer's. The next day we dived the Turtle House. There was Cladophora everywhere. 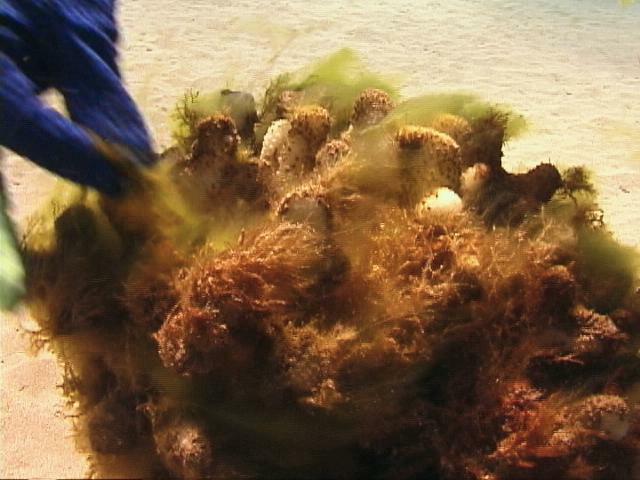 Another coral that we'd cared for each summer by plucking it free from algae has also died. We had named it the "OK Coral." When we reached this coral on our swim back from from the Turtle House, we felt we were OK because we knew we could snorkel home from there if we had to. Our poor little coral wasn't OK any more, and judging by its appearance it too died in last year's bloom, despite our efforts. Our poor little coral wasn't OK any more, and judging by its appearance it too died in last year's bloom, despite our efforts. Our fourth dive was at North House--and here we were astounded. Unlike last summer, this area now had Cladophora growing all over its reefs. Lyngbya majuscula bloomed also, cheek to jowl with the Cladophora, and littering the sand and substrate everywhere were seahares--Stylocheilus striatus. So it's official, at least here. This bloom is worse than last summer's. It's even worse than the 1991 bloom was in early July. If the seahares here prosper as well and decide to "let go", we will have a seahare "rain" the likes of which we've never seen before. If the seahares here prosper as well and decide to "let go", we will have a seahare "rain" the likes of which we've never seen before. Still, the turtles remain. 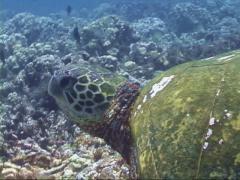 In just four dives we've already identified about 50 Hawaiian green turtles (honu). Sadly, many have grown sick since we last saw them, and others who were sick last summer are now worse. 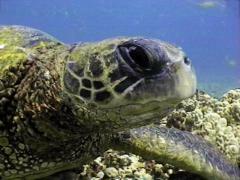 Of the 50 or so turtles we sighted this week our longest resident is now Tutu, known since 1990. 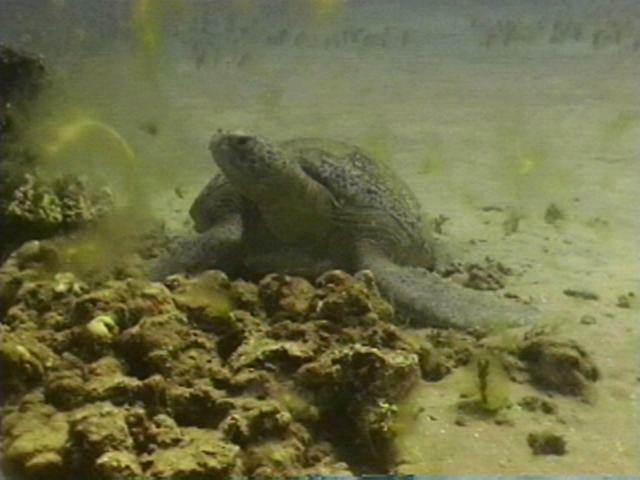 We sighted her at exactly the same place we left her on our last dive August 2000! Tutu looked round and well, so we were surprised to find her home. We expected her to be nesting this season. Either way, it was good to see our old friend again. We sighted her at exactly the same place we left her on our last dive August 2000! 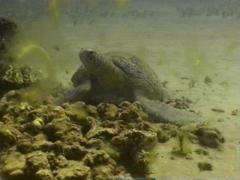 Speaking of old friends, Zeus also answered roll call during our second dive. Like Tutu, he was resting predictably at one of his favourite haunts. We love Zeus as we do Tutu. 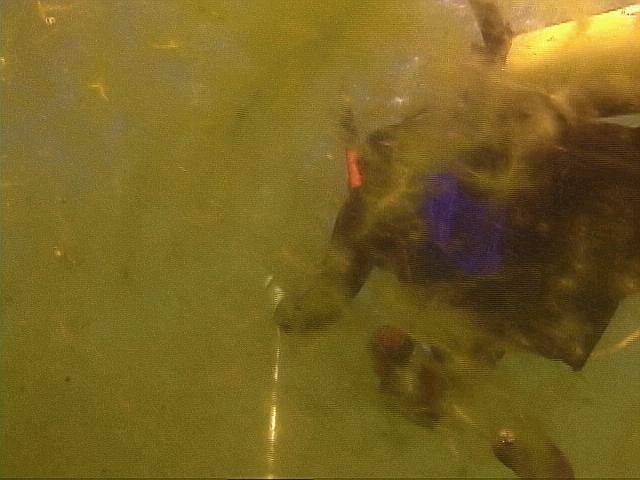 Speaking of old friends, Zeus also answered roll call during our second dive. As mentioned, after diving Reef 2 and then the Turtle House, next on our itinerary was a visit to North House, if for no other reason than to pick up the last of the four temperature loggers that we have placed for George Balazs so that he could monitor Honokowai. 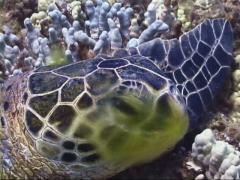 On our way there, we saw a cluster of ten honu resting peacefully. Even from a distance, we could see many were tumoured. 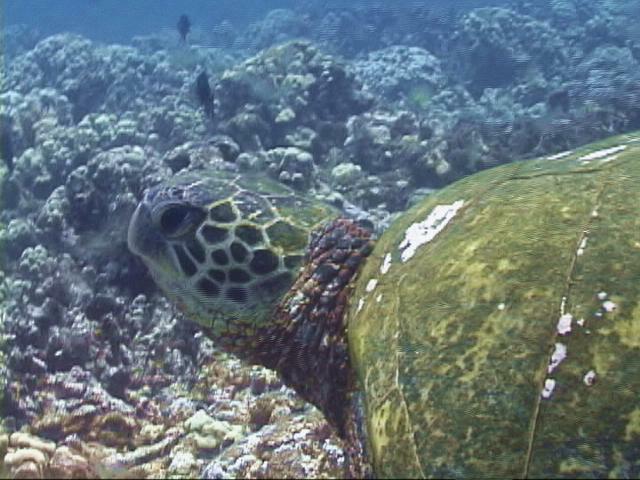 Astonishingly, there among all the honu was the black turtle we sighted last summer! 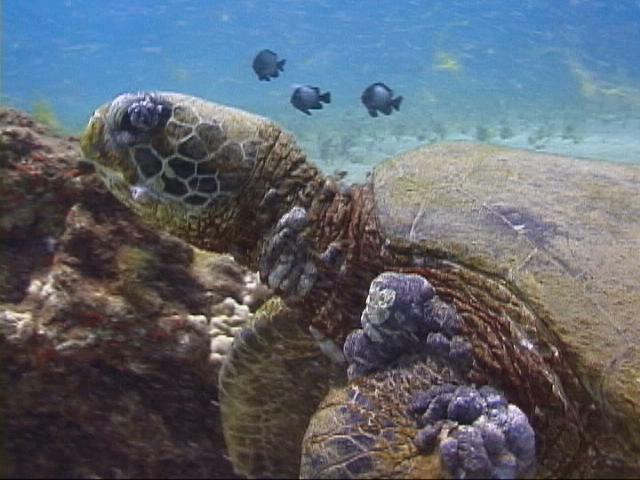 None of us expected her to stay at Honokowai, but there she was--resting in the middle of a pack of honu. Ho'omalu (Hawaiian for "to take care") had stayed the year. Cladophora drifted by as Ho'omalu watched us watch her. While it was a special treat to see her again, we are reminded that Honokowai is one of not a healthy place to be if you are a turtle. Cladophora drifted by as Ho'omalu watched us watch her. ...did we mention Cladophora was everywhere?